To fix a gap in your wall typically requires some sort of patch to cowl the outlet, whether or not it is a metallic patch like the one I am holding here, or another piece of drywall like this. Use a putty knife to loosen the paper tape then peel it off. 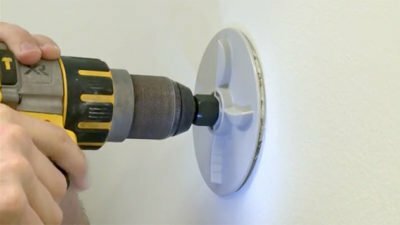 Use drywall screws to attach the drywall to the cleats (picture three) and to any studs between them, as in new development. Screw in two picket boards behind the drywall, one at the high and one on the backside of the opening. Apply a coat of compound and tape to each joint (Picture three). Skinny the compound a bit with water to help embed the tape. Use an abrasive-coated foam block, often called a sanding sponge, to easy a working crack. Fit the gypsum into the brand new hole and press the paper edges coated with joint compound into place alongside the outside fringe of the hole. The trick is to use compound for the second and third coats solely on one aspect at a time. You do not need to apply too much compound, or sand an excessive amount of away, in any one step.